Your grandmother's precious ring. A treasured pin or broach. A necklace from a favorite aunt. Family heirlooms whose legacy you want to honor and preserve by updating and making your own. Or, perhaps, a piece of jewelry you've grown tired of and want to freshen up. Either way, we can help you design a one of a kind commissioned piece and transform something old into a sparkling new creation. Our highly collaborative design team starts by shaping the projected piece to fit the personality and lifestyle of the individual, taking the time to get to know their needs before we put our design hats on. We sit down face-to-face, going over design drawings, gaining new insights, until arriving at a design we all agree is singularly spectacular. 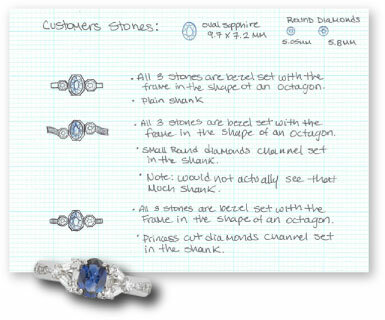 By working together and fully incorporating your thoughts and ideas, we can help create something truly unique for your jewelry collection.